Impeccable Cape-Cod, with Central Air-Conditioner on pleasant, peace street, that is close to major routes, stores and entertainment. This home features a lovely kitchen/dining area, great entertainment space/ large sunroom. Beautiful laminate flooring in living room, hallway and bedroom. Truly a must see home with a great yard for the children to enjoy and perfect for outdoor entertainment. 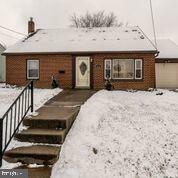 This home features 3 bedrooms and 1.5 baths.